Experience an extraordinary getaway at Berlin Encore Hotel in Berlin, OH. Nestled in Ohio Amish County, the Berlin Encore Hotel is your getaway for New Years Eve. Enjoy a slower pace and experience the finest in Amish cooking, unique shopping, wholesome entertainment and much more. Today we depart for Ohio for touring in the Amish country with our lodging for the next three nights at the Berlin Encore Hotel in Berlin, OH. You will have time to freshen up before our dinner at the Hotel Millersburg, built in 1847 and one of the oldest buildings in Holmes County. Today following breakfast, we will depart with our guide for Lehman's Hardware and Old Time Country Store to play the "What Is It" program. Our next stop will be Wendell August Forge where you will hand hammer your own picture to take home. Lunch today will be on your own at Walnut Creek Cheese, followed by a stop at Lamp and Light Candle for a fun candle carving demo by the Amish ladies. Next, we will arrive at Schrock Heritage Village where we will visit the Antique and Craft Mall followed by a stop at Troyer Homemade Candies to dip Buckeyes. Dinner this evening will be at Castle Club followed by a tour of Millersburg Victorian Mansion and Glass Museum. This morning after breakfast, our local guide will take us to Heinis' Cheese and Kauffman Bakery for lots of samples! 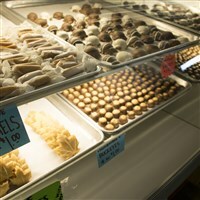 Then it's off to Coblentz Chocolates to pick up a few bargains. Lunch will be on your own at Der Dutchman in Walnut Creek. Next, we will visit David Warther Museum, a fifth-generation carver of Swiss heritage, who is continuing his family's carving legacy. You will then have free time back at the hotel before dinner and a show at The Amish Country Theater. After breakfast, we will depart for home while learning more about the Amish Way. Our arrival home will be early evening.